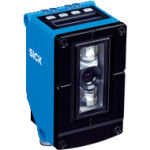 Contrast sensors are primarily used in packaging/printing machines for the detection of printed or control marks. 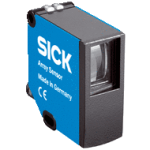 SICK’s line of KT contrast sensors detects even the smallest contrasts at the highest speeds, such as print marks on foils or packaging. They detect minute grayscale variations between the mark and the background on matte, shiny or transparent surfaces. A variety of device types with different contrast resolution methods and teach-in versions are available to meet wide-ranging requirements. The pattern sensor is a proximity-scanning opto-electronic sensor. Distinctive patterns in an image are used as a reference for the subsequent, accurate detection and positioning of objects. A stable switching signal is generated at high speeds with an intelligent algorithm for signal processing regardless of reference marks. It is typically used in the packaging industry. Color sensors detect the color of a surface. The sensors cast light (red, green, and blue LEDs) on the objects to be tested, calculate the chromaticity coordinates from the reflected radiation and compare them with previously stored reference colors. If the color values are within the set tolerance range, a switching output is activated. Luminescence sensors detect visible and non-visible marks that illuminate when using ultraviolet (UV) light. Fluorescent material and marks are reliably detected independently of their pattern, colors or surface conditions on any material. Luminescence sensors emit UV light with a wave length of approximately 375 nm. Fluorescent substances convert the UV light into long-wave visible light, which is then received and evaluated by the luminescence sensor. Fork sensors, which operate using a through-beam design, combine the sender and receiver in a single housing. As a result, alignment is no longer time-consuming. Even very slight differences in light attenuation are detected due to highly focused light emission and high detection accuracy. Easy installation, high immunity to ambient light, and a wide range of fork widths are some of the many advantages that SICK fork sensors offer. Applications include detecting labels or parts on conveyors. Array sensors use closely spaced beams of light to detect even the slightest differences in gray scale between the target and the background within their field-of-view. They are ideal for edge and diameter detection as well as detecting widths and gaps. 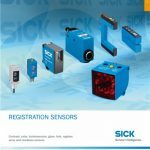 SICK’s array sensors offer industry-leading reproducibility, in addition to compact, rugged metal housings for use in highly restricted or harsh environments. The register sensor line complements our wide range of contrast sensors. All of these sensors have a register control system, ensuring an optimal solution to detect marks in tough print conditions with extremely low contrast, complex colorful printouts or at very high speeds. Our range of register sensors also includes an ATEX certified fiber-optic product, ensuring safe solutions in hazardous areas (e.g. when using solvent based ink). The Glare sensor detects and distinguishes glare on even surfaces. It also provides maximum reliability and saves costs. Previously, gloss on object surfaces was a disruptive factor that regularly had engineers breaking into a sweat. Now, gloss properties are a distinguishing criterion for process control – regardless of color, transparency or pattern. And it will be engineers’ eyes that shine, not their brows. Equipped with intelligent Delta-S-Technology, Glare is a further milestone in customer-oriented sensor development. 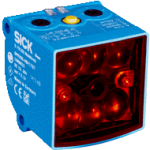 Once again, SICK is confirming its leading position in opto-electronic sensors for the detection of a range of objects.